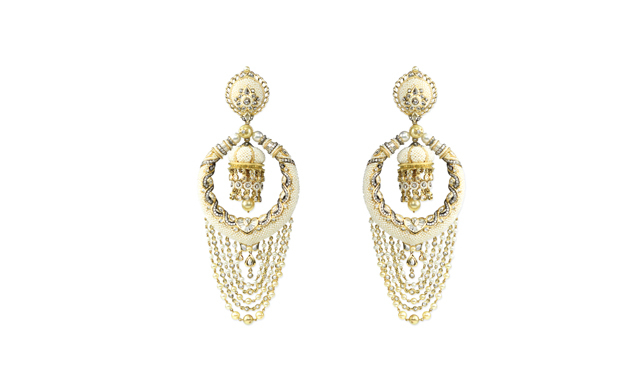 Inspired from the splendours of Mughal India, magnificent shapes are crafted with exquisite attention to detail. Rare pieces of imperial provenance come together to incorporate antique Mughal and sinuous motifs. Traditional forms display vibrant juxtapositions of color and texture with a modern touch. A poetic fusion of gracious style, traditional mystique and raw charisma, timeless pieces of the Taantvi collection are woven together with ageless Keshi pearls in forms that define eternal elegance. Fine diamonds, emeralds, rubies and sapphires that transcend into bracelets, bangles, earrings, rings and necklaces. 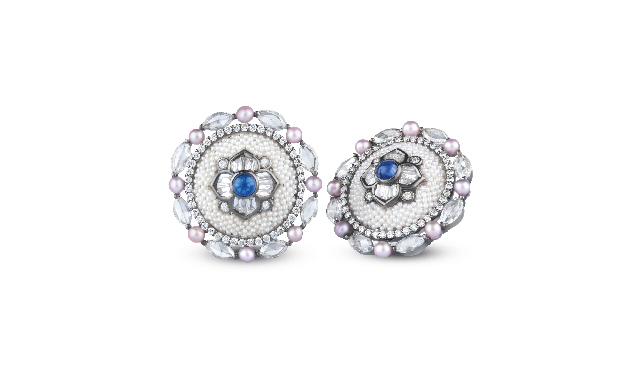 Inspired from Mughal India, these earrings crafted in 18kt gold are set with fine Burmese blue sapphires in the center with round brilliant cut and marquise rose cut diamonds on the periphery, accentuated by freshwater pearls. Crafted in 18kt gold, these contemporary earrings are draped with fine Japanese Keshi pearls and set with round brilliant cut and baguette diamonds marked with rose cut diamonds in accents. 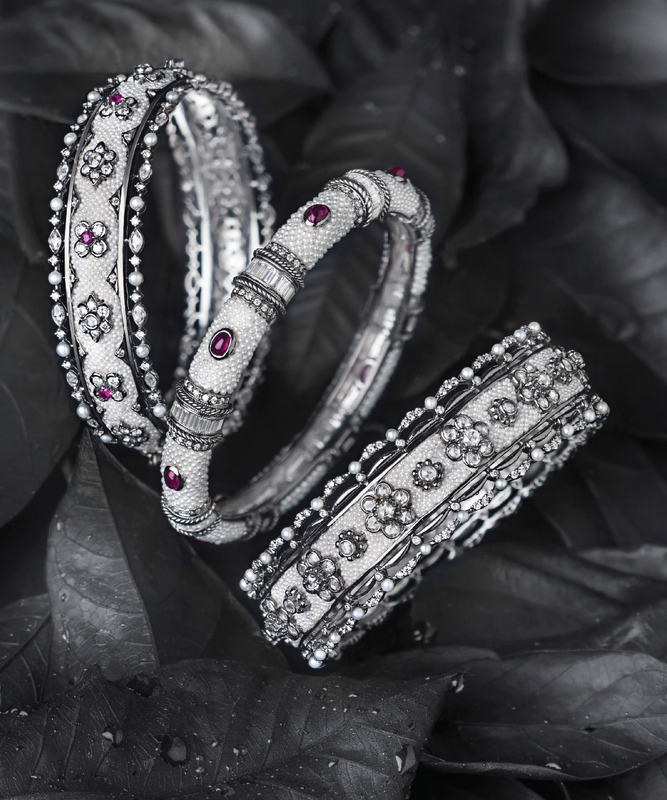 Magnificent forms are embellished with fine Japanese Keshi pearls, accentuated with Burmese rubies, fine baguettes and round brilliant cut diamonds in this Taantvi bangle. Elaborate Japenese Keshi pearls are intricately woven with 3.46 carats of round brilliant cut and rose cut diamonds with accents of Burmese rubies. Crafted in 18kt gold. 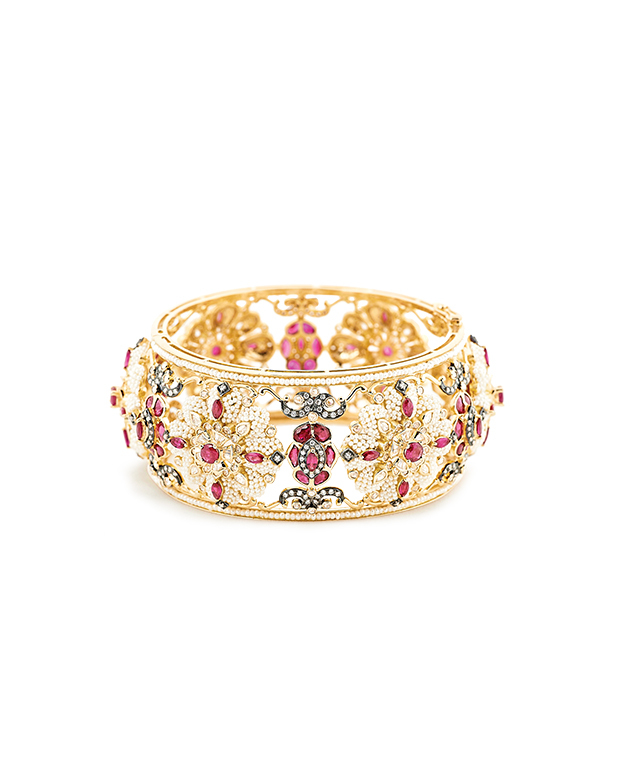 This Moksh bangle, crafted in 18kt gold, is woven with fine Japanese Keshi pearls and encrusted with 3.10 carats of baguette and round brilliant cut diamonds, with Burmese rubies in accents. Rose cut diamonds are encased in fine Japanese Keshi pearls and nestled in a bezel of round brilliant cut diamonds, set in 18kt gold.